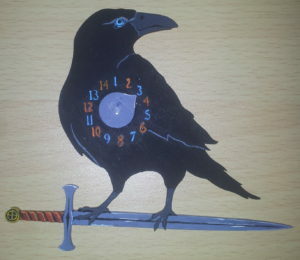 The Crows Feast is returning to Group North on April 8th. Entry is $20 for members and $25 for non-members. This is a 2000 point Kings of War (2nd ed) competition over four rounds of different missions. The competition is run in a format similar to Clash of Kings players pack. Full details of the competition are available in the players pack. See GroupNorth.club or Facebook for more details. I'm bringing Santa Claus and his rorty elves. Tis the season for carnage! I'm definitely coming to this one. Still assembling/converting/scratchbuilding a new unit for the army. I will send payment in the next week. 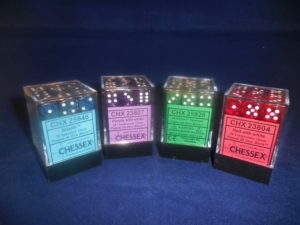 Our first event sponsor has joined with Nerdavana Games SA adding some chessex dice blocks to the prize pool. The prize for one random player who pays on or before 31st of March will be a copy of Dragon Rampant by Osprey. A question was asked about what forces the Destiny of Kings heroes count as. They will count as army forces provided they match the same alignment as the base army, others they will be allies. Any inspiring will only be to units of the same type as the hero. Also remember we are using pre-Clash of Kings army lists. If using the EasyArmy builder make sure you have the appropriate army lists selected. As I won't have my Santa Claus elven hordes painted in time, I will be using an alternative army: Bad Santa and his Empire of Dust sweatshop staff. Mortibris the Necromancer from Destiny of Kings is standing in as Bad Santa, but I did need to clarify that his spells and ability would work on the Empire of Dust units as normal. I will have labels on units as reminders of what they represent, but they should all be reasonably obvious. Jackal Laser Design has joined as a sponsor for Crows Feast. 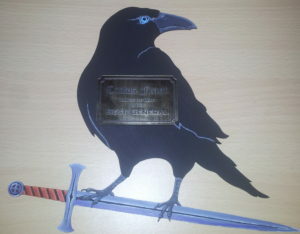 Here are the main prize trophies and turn counter dials they have cut for us. Thanks for all the recent entries received for the competition. Don't forget that if you can't make a payment by Friday you can still enter the competition right up to the start of the competition on Saturday 8th. There have also been requests for people who can't make a full days gaming to be able to share an entry spot. This will be allowed; the entry will cost whatever the most expensive rate is (so $25 if one player isn't a club member, $20 if both are members). You can play any combination of games (1-3 or 2-2) and may provide different armies during each players games. The team won't be eligible for the best painted prize or the bonus points for painting if the army is changed (as we won't know what army to judge). Any awards for the players will be split at their discretion. The rounds to be played must be announced when entering (to prevent players swapping out to ensure the best army matchups). As always preference is for everyone to come along and enjoy four full games of Kings of War, along with the food and festivities accompanying the day. Don't forget you can still enter the event up to the starting time on Saturday. If your are interested in attending please let the TO know here or at crowsfeast@groupnorth.club. There is plenty of room. If you are a new player with only a few games then this is the perfect day to really improve your game; if you don't have enough points to make an army lets us know and people will be able to loan armies or the points you need. 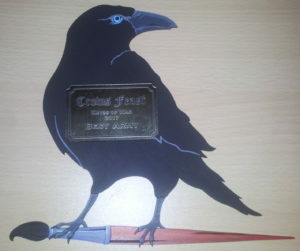 Many thanks to Lance for organising Crows Feast! I had a good day of wargaming, with two wins and two draws. All of my opponents were a treat to play against and I hope to have more games with them in future. The dice were at times cruel and kind, but I think they averaged out for me over the day. In one game I was one pip on a dice off the draw becoming a win (routing a unit carrying a loot token), in another game one pip on the dice gave me a draw instead of a loss. I also had a couple of seniors moments. In one game I was thinking I was moving as second player on turn 6, only to discover that I was actually the first player, so my opponent had another round of moving and fighting! I also kept forgetting to roll regeneration on my pharaoh in one game. A standout 'oh no' moment was when I charged several hordes into ogre berserkers and barely scratched them. I then lost four hordes in one turn, which left me with very few figures on the table. The cheap swarm horde in my army earned an MVP award in one game, for fighting an ogre general and eventually killing him after four turns of one versus one slugging. My overall MVP unit was a tie between the Amunite Pharoah for dishing out a few points of damage almost every turn in melee through the four games and surviving the fights, and the horde of enslaved djinn archers for their consistent shooting damage wearing down units. My Bad Santa Empire of Dust army will make its next appearance at my Group North Christmas game. I have been wondering about doing a theme Easter Bunny chicken army using the Herd list, but I suspect I will be hammered on the painting (lack of) score! Maybe Good Santa will put in an appearance next year. Thanks to everyone who turned up and made it a great day. Tim Cook's herd army took Best Army, Ross Dawe won Best General. Bummer I couldnt go but my son was offered a position to play Auskick at half time in the showdown.